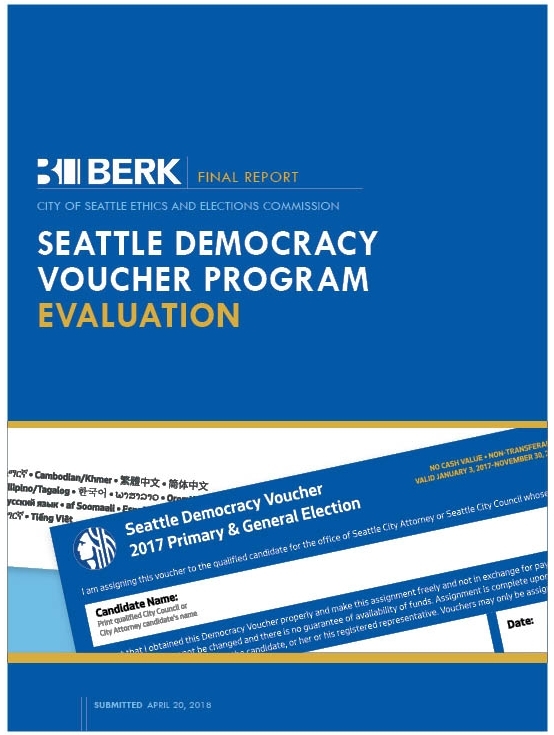 In early 2018, Seattle Ethics and Elections Commission (SEEC) asked BERK to conduct an independent evaluation of the Seattle Democracy Voucher Program (DVP), a first-of-its-kind public campaign financing program. The program was approved by voters in 2015 and launched in advance of the 2017 election cycle. All eligible Seattle residents received $100 in Democracy Vouchers that they could use to support candidates for local office. Thirteen candidates for city council and city attorney participated in the program, and $1,140,525 in program funds were issued to candidates. Achieve high rates of candidate participation. Enhance democracy and accountability in Seattle elections. Achieve heavy utilization of vouchers by residents who have not previously donated to Seattle political campaigns. Maintain high public satisfaction with the program. BERK's evaluation included extensive data analysis to understand which kinds of residents used their vouchers, and which did not. We interviewed several candidates and campaign staff, representing those who participated as well as did not participate in the program. We surveyed Seattle residents to gauge program awareness and support. We also conducted focus groups with the City's Community Liaisons and staff from nonprofit organizations that worked to encourage voucher usage by underrepresented groups. Our findings were summarized in a report that included four key takeaways and 14 recommendations for improving the program's effectiveness in future election cycles. Throughout the study we coordinated closely with SEEC staff to ensure we fully understood how the program operated and the constraints they were navigating during the 2017 election cycle. This helped to ensure that the independent recommendations we developed were relevant and actionable. A few of the recommendations required action by City Council, and in June 2018, council voted to approve changes to the DVP, including one recommended in BERK's report.